My first APE! Where to begin? I’ve been to every Alternative Press Expo since this one, so it’s become less of a thrill and more of a duty/pilgrimage, like Easter Mass. Still, I’ve had a lot of good times at APE over the years, despite never selling very much and almost always breaking into tears at some point. Helen’s T-shirt says, “They Want To Make a T-Shirt Out of Your Dreams.” This was on a homemade T-shirt worn by an extremely smelly young hippie dude who showed up for a Dan Clowes/Chris Ware signing at the Cartoon Art Museum, leading a puppy on a string. The amazing thing about Dan Clowes, it turns out, is that a disproportionate number of his fans resemble Dan Clowes characters. Maybe he has a very specific personal magnetism that attracts people who look like their own worst driver’s license photos. Over a year later, Andrew and I spotted the smelly dude again, sans puppy, walking down Market Street. We tailed him for a while, and I think he realized it. Dave’s T-shirt advertises Cyna Bon, the comic Andrew was working on at the time with Eunice Kim, whose drawing of Cyna herself appears in the sketches. I forgot to color Artie. 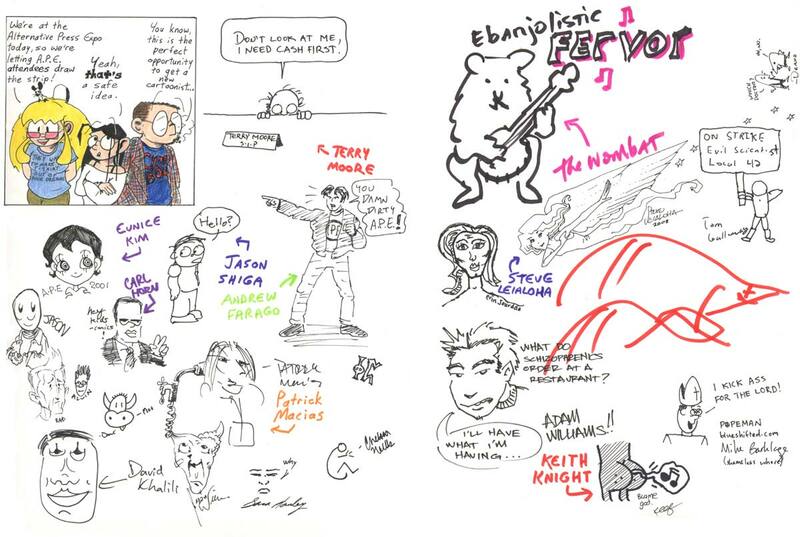 At top center is guest of honor Terry Moore, who was really nice and, as you can see, even did a little sketch for me. Also represented are my cartoonist friends Jason Shiga, Jason Thompson, and Keith Knight. The lovely flying girl is by comic-book artist and inker Steve Leialoha, probably best known today as the inker on Fables and as the longtime companion of feminist comics historian Trina Robbins. Patrick Macias and Carl Horn were both Viz editors at the time they sketched themselves here; Carl now works for Dark Horse, and Patrick lives in Japan, where he runs the magazine Otaku USA. Along the right edge (assuming WCN doesn’t cut it off, which I think depends on your browser), you can see sketches by Viz IT manager Dean “Deano” Blackburn, Narbonic reader Tom Galloway, and Mike Barklage, doomed to become the publisher of the Narbonic print collections. I don’t know who the Wombat is. Okay, new Sunday material: way back at New Year’s (it’s taking me a while to catch up on things), Meg sent me this photo of herself and her friend Laurie at a costume party. Writes Meg, “The theme was ‘Monsters and Minions’ and without realising it, my friend and I both dressed as Narbonic characters. I’m the female Dave and my friend Laurie is Mell.” Excellent! Man, I wish I’d turned Dave into a girl more often. He’d probably never agree to wear that T-shirt, though. Well, of course he wouldn’t. It would be a lie. They’re the product of Science! Actually, it says “They Want To Make a T-Shirt Out of Your Dreams.” Personally, I prefer the third possibility – “Our Dreams”. And then, of course, one must imagine the Dr. Seussian contraption that turns hopes and yearnings into tight-fitting machine-washable 100% cotton tees. Maybe you should’ve gotten the APE attendees to draw a single part of that contraption, given a pre-drawn start and end. Something to remember for the future? I like the Seuss-meetsRube Goldberg idea, too.